Hand- and foot-switched versions available. It’s often the apparently small details that make for a truly authentic sound. This is also true for a convincing Hammond sound. If a more “rocking” sound is desired, of course some proper distortion is required to give the sound the right “drive.” “Drive“ being the key word. The Organ Drive from Berlin is a fascinating device devoted to exactly this. We’ve looked into the inner workings of the Organ Drive. The ORGAN DRIVE from the Tube Amp Manufactur company in Berlin comes in an elegant, compact brushed stainless steel case, which is robustly built with a vintage look. It is a new tube preamplifier or tube distortion pre-stage which is available in both hand- and foot-switched versions, and can thus be used as either a foot-controlled effect or as a desktop device set on the instrument or amplifier in question. The control panel is provided with numerous rotary potentiometers in vintage style (6 pots in total), as well as a number of LEDs and chromed mini toggle switches for the unit’s various functions. The two 12AX7 preamp tubes (ECC83 – comparison type), mounted in a separate casing with air vents on the left rear of the case, stand out. These can be easily replaced (e.g. for sound optimization) just by loosening a single screw. Next to them, two 1/4” / 6.3mm jacks for INPUT and OUTPUT are fitted. To their right is the plug for the 12-volt power supply (included) which can be locked in place by its bayonet plug. Two rocker switches labelled CHANNEL and BYPASS are mounted on the front part of the case. The ORGAN DRIVE is conceived and built as a tube preamplifier/distortion for Hammond organs and clones, but is also perfectly suited as a preamp and distortion for vintage E-pianos (e.g. Fender Rhodes or Wurlitzer) It can also be of interest to guitarists as an additional effect device. The instrument and amplifier are connected via the two 6.3mm (1/4”) jacks. Generally, a Hammond organ signal is fed via a patch cable into the INPUT jack (mono) of the ORGAN DRIVE. The output signal is then fed from the OUTPUT jack (also mono) into additional effects (e.g. rotor effect), amplifier, keyboard amp, rotary speaker, or even a mixer. 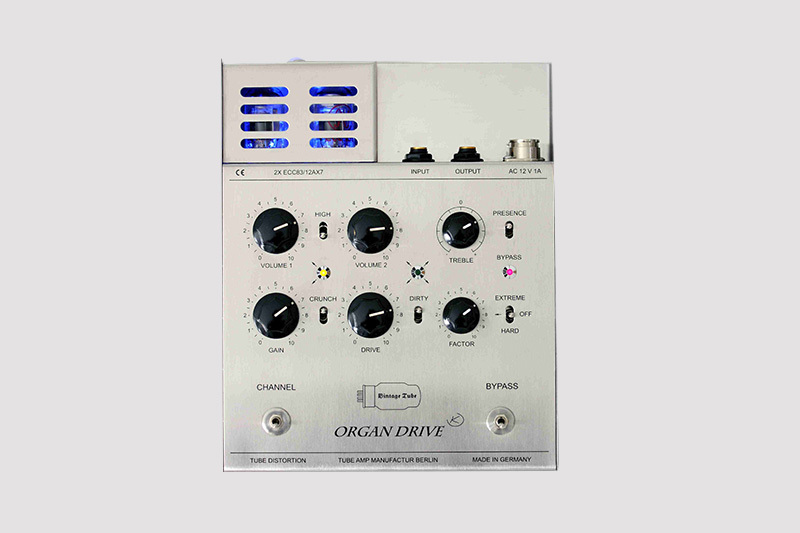 Although the ORGAN DRIVE is designed as a mono device, two separate tube preamp channels are available, which can be selected and switched by means of the CHANNEL rocker switch. In this way, the two 12AX7 preamp tubes can be switched. The selected tube channel is indicated visually by the yellow LED on the left, or by the central green LED. The input sensitivity of each channel can be adjusted by the GAIN rotary potentiometer. This also sets the distortion level of the first stage. If the instrument line signal is too weak or at too low a level, the signal can be powerfully amplified by the HIGH rocker switch between the two Volume knobs. For instruments such as a true electromagnetic Hammond organ with a high output, the user should first adjust the VOLUME knobs on the ORGAN DRIVE. If the input volume is too high, the device level could shoot upwards. The signal can additionally be distorted across a wider dynamic range using the CRUNCH rocker switch. The VOLUME 1 pot controls the volume of the first tube preamp channel. 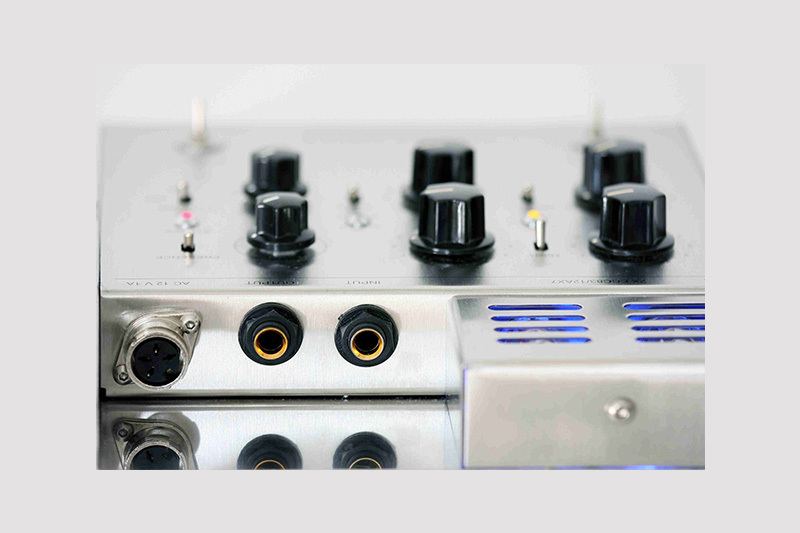 The second tube preamp channel is equipped with a wider range of possible settings. Here, both preamp tubes are activated. The second channel’s input level can also be amplified strongly via the HIGH toggle switch. The volume level of the second tube preamp channel can be adjusted by the VOLUME 2 rotary potentiometer. With the DRIVE pot, the overdrive level of the preamp tubes for the second channel can be continuously varied. If a particularly “dirty” sound is desired, the mini toggle to the right of the DRIVE pot can be switched to DIRTY. The rightmost FACTOR pot is particularly interesting. It permits the tube distortion level, or factor, to be adjusted. 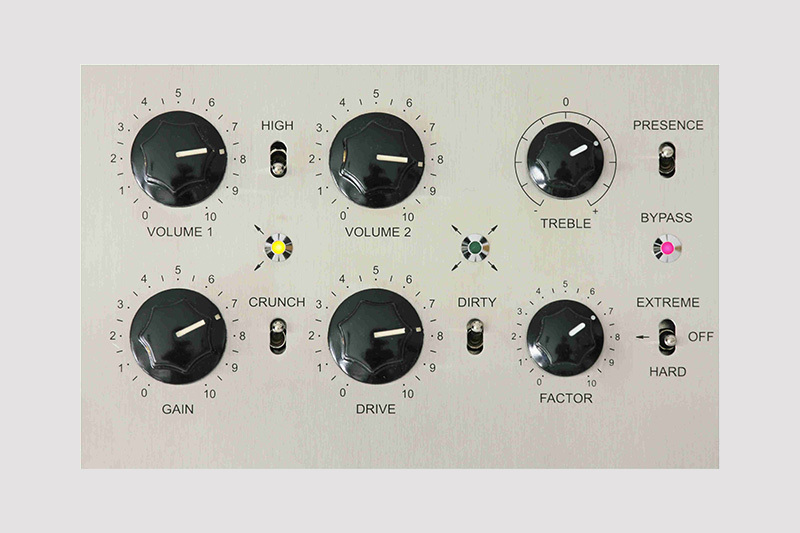 Using the associated mini toggle switch, the type of distortion can be selected between HARD, OFF (soft) and EXTREME. The FACTOR control sets how quickly distortion kicks in as input level (dynamic) increases. Above it, the TREBLE rotary pot and the PRESENCE switch to its right can be used to adjust the tone of the second channel to achieve an optimal tube preamp sound. This permits the user to dial in the ORGAN DRIVE to their personal sound taste. To bypass the ORGAN DRIVE sound and feed the direct signal of the input instrument into the connected amplifier, the BYPASS mode can be activated with the front right-hand switch; this setting is displayed via the red LED. Apropos SOUND… we come now to the matter of the ORGAN DRIVE’s tone. To test the ORGAN DRIVE, a chopped (modified for transportability) Hammond B3 from 1973/74 was coupled with a keyboard preamp, and a selectable Leslie preamp driving a Leslie 145 speaker enclosure. Once the power supply is attached to the ORGAN DRIVE, a beautiful red glow emerges from the two preamp tubes at the back of the enclosure, shimmering out through the vent slots – a lovely optical effect. The user quickly finds their way through start-up and the first tries at dialling in a sound; you feel immediately that the sound of the connected instrument (in this case a Hammond B3) sounds fuller and fatter than accustomed. The first tube channel (CHANNEL 1) produces a beautiful, warm, smooth, lightly distorted tube sound. For those looking for a wilder, more “rocking” sound, switching the CHANNEL toggle to the second tube channel generates the desired tube distortion sound with a widely variable intensity – even as far as the most outlandish, spaced-out rock organ overdrive tones. The various settings possible thanks to the different rotary pots and switches provided by the ORGAN DRIVE make for a wide range of sound possibilities. Also interesting: Using the TREBLE pot and PRESENCE switch, an older, duller-sounding Hammond can acquire fresh pep, freshness and brilliance in the upper register – a terrific feature! And if the player at some point wishes to disengage the ORGAN DRIVE while playing, they simply activate the BYPASS function, which bypasses the tube preamp without distortion by means of a switching relay. 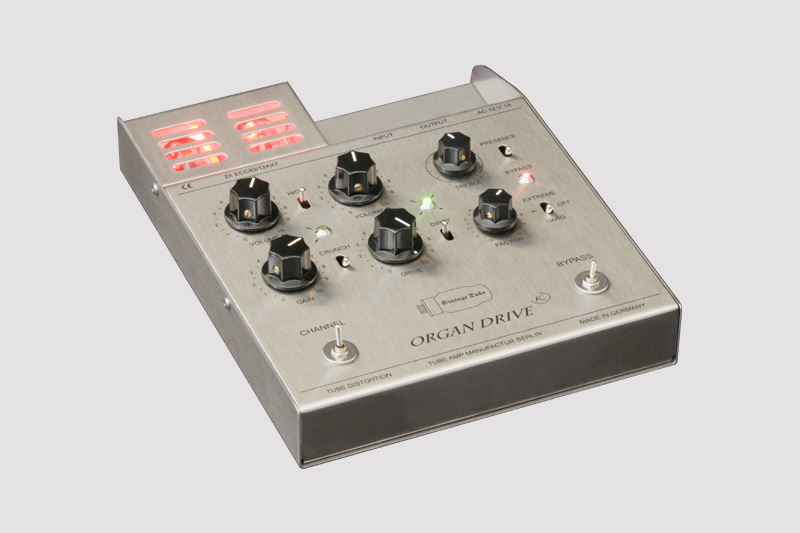 The ORGAN DRIVE is an ideal tube preamp for all lovers of distorted, funky, rocking organ tones. The ORGAN DRIVE allows not only the legendary Hammond A100, B3, C3, or RT3, but also the less prized electromagnetic L-, M- and solid-state T-Series Hammonds to roar. Even a Hammond T100, T200 or T500 can grunt and scream with the ORGAN DRIVE. Also electronic Hammond organs like the X5, B100, B200, B250, or B300, and even today’s digital Hammond clones benefit from the richness of this outstanding tube preamp. Nevertheless, the ORGAN DRIVE can also be used with other vintage keyboard instruments such as (e.g.) a Fender Rhodes electric piano, a Wurlitzer A200 E-piano, or even for the distorted, funky sound of a Hohner Clavinet. The ORGAN DRIVE’s vintage-style metal case seems sharp-cornered at first (recognizable from the zinc chassis of old Hammonds); it might be an idea to give the case for this series a bit of a de-burring polish. A jack for a footswitch for the BYPASS function could also be advantageous. At 429 € (incl. 19 % VAT), the ORGAN DRIVE isn’t cheap, but the price buys you a rugged, outstanding-sounding device, delivered free to your door within the EU.